This perennial interest has come into mind again upon receiving for review Anthony Goldstone's recordings of Schubert's major piano music [The Divine Art, 3 CDs] and, with his wife Caroline Clemmow, the latest of their duo explorations of that inexhaustibly fascinating composer. One can be "imprinted" with loyalty at an early age; for me the Schnabel recording on 78s of the late A major sonata, with its terrifying slow movement, remained a compelling and memorable experience for decades (now available on EMI CHS7 64259-2). 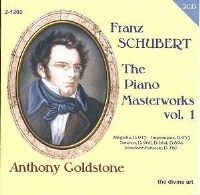 I have continued playing Schubert's sonatas and other pieces amateurishly at the keyboard throughout a long life with music, and Anthony Goldstone's "The Piano Masterworks" for The Divine Art has me thinking again. Schubert is of course superbly well served by the record industry in his every genre, most recently by Hyperion for his songs. Not wishing to duplicate or challenge the expertise of famous pianists, nor that of specialist reviewers, I want here to share a few of my perhaps idiosyncratic preferences. Goldstone's selection has attracted well deserved praise, which I would not wish to undermine at all. His interpretations that I have sampled are all thoroughly sound, yet for me less searching and involving than Schuchter's. For comparison I suggest that interested collectors might like to try to hear both pianists in the unfinished Reliquie Sonata D.840. Schuchter on TUDOR 743 is more expansive (24 mins for the two movements); Goldstone on The Divine Art 2-1204 takes 33 mins for his completed four movement version, in which he deliberately refrains "from detailing where Schubert ends and I begin". - - an entirely delightful integrale Tudor 741-752 of the complete Schubert solo piano works, played idiomatically and with evident affection by Gilbert Schuchter (1919-89), whom Karajan called his own "beloved teacher, to whom I owe my entire musical education". And, joy of joys, Schuchter is recorded on a sweet-toned Bösendorfer, just right for this music. - - If you have a chance to sample, for example, the Grazer Fantasie on the first of the twelve CDs, you will need no more persuading. I suspect that the unknown Schubert piano music has many hidden gems to discover, just as Graham Johnson found whilst recording all the songs for Hyperion. These have been my benchmark for the last five years and I have returned to them once again this weekend. I should love to know whether Anthony Goldstone is familiar with them; the opinion of one artist about another may tell more than any number of critics' comparative reviews? 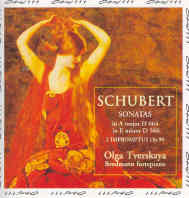 Very glad you mention Tverskaya and Staier's recordings of Schubert sonatas on period instruments, which do demonstrate unique attributes of the music by virtue of the relationship between Schubert's written scores and the particular timbres, voicing possibilities, sustaining power, etc., of the instruments they play on. Bilson's recordings, very different to either of the above, are also ones I value very highly (and those of Lambert Orkis of the Impromptus). Whilst I wouldn't for a moment wish to suggest that these artists are anything less than amongst the finest of all Schubertians, one question does cross my mind - why is it still practically unknown (or even unthinkable) that all but a tiny few big international 'superstar' pianists would consider performing this (and other) music on the instruments that the composers knew and wrote for? Tverskaya in particular is most unusual in being a pianist of Russian training who has gravitated in this direction. The arguments that one often hears, that those who play old instruments are simply those who couldn't make it on 'real' pianos (rather like similar comments often made about those who focus upon contemporary music) won't wash any longer (if they ever did) - Staier's recording of D960 can, in my opinion, stand its own alongside the Schubert recordings of Schnabel, Yudina, Sofronitsky, Richter, Brendel, Pollini, Uchida or whoever. But I would like to have heard (or would like to hear, for those of them still alive) what any of them would have created when bringing their own very personal insights into play with an engagement with the different possibilities of the period instruments.